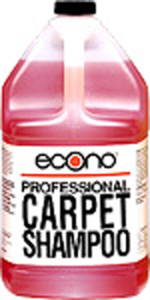 Econo Carpet Shampoo is a professional strength shampoo designed for commercial use. This controlled suds product is formulated with biodegradable surfactants for proper wetting and cleaning. Sequestering agents are part of the formula to aid the cleaning and drying process. Finally, optical brighteners are added to enhance the fabric color, leaving a “like new” appearance. Econo Carpet Shampoo is safe on natural and synthetic fibers when used as directed. A rich foam cleans the carpet to prevent getting the backing wet and causing mildew. 1. Vacuum carpet and pre-spot heavily soiled areas and traffic patterns with Finger Lakes Spotlifter. 2. Dilute Econo Carpet Shampoo 9 ounces per gallon for normal soil and as strong as 16oz per gallon for heavily soiled areas. 3. Use with an automatic Shampooing machine, allow to dry.